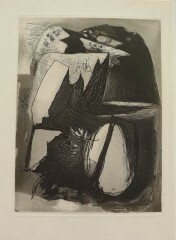 Graham Sutherland was a painter and etcher. Born in London. In 1920 he was an apprenticed at the Midlands Railway Works as an engineer. 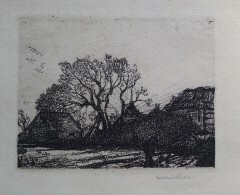 Between the years 1921-26 Sutherland studied etching at Goldsmiths School of Art where he was taught by etcher and engraver Frederick Marriott and later Malcolm Osborne, his contemporaries included Paul Drury. In 1925 he was elected an associate member of the RE. The Wall Street Crash in 1929 made him, like many other artist’s of the time, use his skills in designing posters, china, glass and fabric. 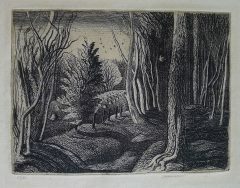 He started to take up painting and began to visit Pembrokeshire, a landscape which inspired his work. 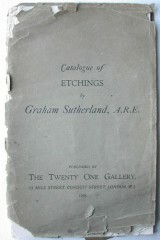 During the Second World War Sutherland had been an appointed an official war artist; recording bomb damage in London, Cardiff and France, and the limestone quarries in Derbyshire. Shortly after, he made a return visit to Wales painting the coastal landscape near St David’s. After the war Sutherland visited the South of France, where he met Picasso and Matisse. 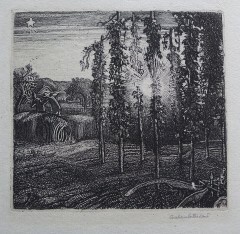 In 1952 his work was shown at the Venice Biennale and in 1955 at the São Paulo Bienal. 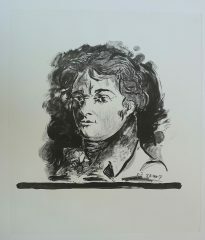 A major retrospective was held in 1998 at the Musée Picasso, Antibes. Sutherland was commissioned to design the huge tapestry of Christ in Glory, installed in Coventry Cathedral in 1962. He was frequently commissioned to paint portraits, his portrait of Winston Churchill, which caused controversy and was destroyed by Winston’s wife. 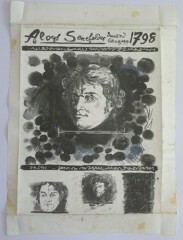 Sutherland was awarded the Order of Merit in 1960 and named as a Commandeur des Artes et des Lettres in 1973. Sutherland died on 17 February 1980 in London.